Most Edmonton Oilers fans are probably on board with the addition by subtraction theory right about now with the firing of Peter Chiarelli on Jan. 22nd. In fact, some of them may even argue the collective IQ of the hockey club just went up without the former general manager and president of hockey operations on board. 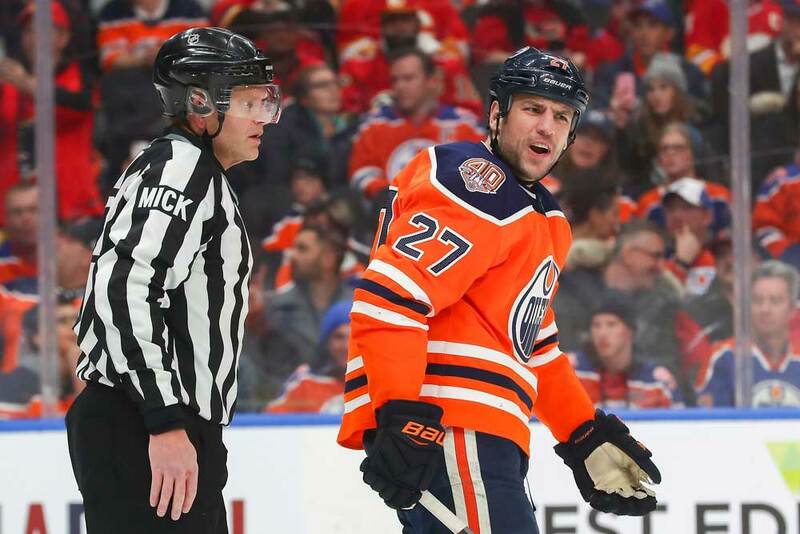 The Oilers made the move after losing their third straight home game when they were edged by 3-2 by the Detroit Red Wings. It was also their ninth loss in the last 11 outings in their own backyard and Detroit entered the contest tied for 31st place in the 31-team league. Edmonton now enters the extended All-Star break with a 4-6 record in their last 10 games and are 23-24-3 overall for 49 points. But because there’s such a logjam in the Western Conference the Oilers are still in the playoff hunt as one of about eight teams with a legitimate shot at a wildcard berth. Still…the team has been floundering and since they hired Ken Hitchcock earlier this year, as its eighth coach in 11 years there was nobody else to blame really other than Chiarelli. There’s no question the 54-year-old has a lot to answer to for the current state of the team, but to be honest, Edmonton wasn’t exactly a well-oiled machine when he arrived in 2015 either. It’s almost unfathomable this organization is in the state it’s in with all the top talent it’s drafted over the past dozen years, but that’s another story for another day. Edmonton CEO Bob Nicholson obviously didn’t want Chiarelli in the driver’s seat heading into the February 25th NHL trade deadline and who can blame him? Chiarelli’s trading acumen took a huge hit when he shipped out high-scoring forward Taylor Hall to the New Jersey Devils for defenseman Adam Larsson in June, 2016 and it’s never recovered. Of course, Hall went on to win the Hart Trophy last season as the NHL’s most valuable player while Larsson has been steady but not spectacular on the Oilers’ blue line. With Connor McDavid likely being the best hockey player in the world right now he’s arguably wasted some of the best years of his career in Edmonton. He’s played just 13 career playoff games with the franchise since being drafted first overall in 2015. McDavid’s getting some help from the likes of Leon Draisaitl and Ryan Nugent-Hopkins, but that’s about it. The rest of the lineup is underachieving and there’s not much room for improvement since there’s close to $73 million committed in salary for next season. Chiarelli painted himself and the club into a corner with some of his other moves such as shipping Jordan Eberle to the New York Islanders for Ryan Strome and then dealing Strome to the New York Rangers for Ryan Spooner. Those moves certainly didn’t work out as Spooner was placed on waivers a day before Chiarelli was fired, with no takers. Defenseman Justin Schultz was sent to the Pittsburgh Penguins in 2015 for a third-round draft pick. Schultz, who’s still just 28 years old, had 101 points in 248 games in Edmonton and has notched 90 points in 163 outings in Pittsburgh. He’s won a pair of Stanley Cups and chipped in with 25 points in 48 postseason contests. Schultz was a minus-78 in Edmonton and is plus-57 with the Penguins. He was top-10 for defenders in 2016/17 for points, assists and plus-minus. You can definitely debate his value and how he was used and developed in Edmonton. Another odd move in Chiarelli’s 31 Edmonton trades was sending young winger Drake Caggiula to the Chicago Blackhawks for rearguard Brandon Manning. In case you don’t remember, Manning was the player who broke McDavid’s clavicle when the Oilers’ star was in his rookie year. Fans are also wondering if Edmonton prospects Kailer Yamamoto and Jesse Puljujarvi would be better off learning their craft in the AHL rather than the NHL. The players are just 20 years old and aren’t really learning anything with the Oilers other than how to lose. Their confidence is taking a beating and their development is almost non-existent. And speaking of Puljujarvi, Chiarelli chose him fourth overall in the 2016 draft while players such as Matthew Tkachuk, Clayton Keller, Mikhail Sergachev, Tyson Jost, Charlie McAvoy, Jakob Chychrun, Alex DeBrincat, Samuel Girard and Jesper Bratt were still available. It wouldn’t be fair to criticize Puljujarvi since he could still become a star, but there’s nothing wrong with questioning the drafting of him. One of the last moves Chiarelli made was signing goaltender Mikko Koskinen to a three-year contract extension worth $13.5 million. Koskinen and fellow Oilers’ netminder Cam Talbot were both set to become unrestricted free agents in the summer. Koskinen’s stats are quite a bit better than Talbot’s so far this year. However, they’re not really worthy of $4.5 million a year, especially since he’s 30-year-old and has a grand total of 32 games’ NHL experience under his belt. The signing probably means the writing’s on the wall for Talbot. But the Oilers may not be overpaying unproven goaltenders in 2018/19 if former GM Craig MacTavish didn’t trade Devan Dubnyk to the Nashville Predators for Matt Hendricks in 2014. He also retained half of Dubnyk’s salary in the deal. As for Koskinen, unless the Oilers improve dramatically in their own end he’s not going to be the answer as he simply doesn’t have enough effective players in front of him. It will be hard to find anybody who’s surprised that Chiarelli was sacked. He made numerous bad trades, overpaid for free agents such as Milan Lucic, who’s making $6 million a year for seven seasons, and hasn’t improved the club in the standings. We should also mention he dealt the 16th and 33rd overall draft picks in 2015 to New York Islanders in exchange for defenseman Griffin Reinhart. Mathew Barzal, last season’s rookie of the year in the NHL, was taken 16th while Sebastian Aho was still available at 33. Reinhart played just 29 games with the Oilers, registering one assist, and was left unprotected in the 2017 Expansion Draft when the Vegas Golden Knights took him. He’s been in the minors ever since. Chiarelli isn’t the only one to blame for the disarray the Oilers are in, but he sure deserves a good portion of it. The team has made the playoffs just once in the past dozen years despite the wealth of talent that has suited up for it. This includes a total of nine top-10 picks in the draft over the past 10 years including a pair of Hart Trophy winners in Hall and McDavid. The job of cleaning up the oil spill will now lie on the shoulders of Keith Gretzky, who has been named the interim GM. He’s expected to give way to a full time newcomer in the future and the next man on the hot seat will be Edmonton’s fourth general manager in the past decade.